A late start in Florence after yet another breakfast with the most illogical toaster that I’ve ever seen. We don’t have to be out until 12. Nice one. Out we go into the heat, yes I said heat. It was 32 degrees celsius at 10:30 this morning. I believe it was -1 degrees in Bright in North Eastern Victoria this morning. Apparently there is some sort of heatwave sweeping through is part of Europe at the moment. Most unseasonal. Off to the rental car office. A little tricky to negotiate the Italian language at times, but we get there. We are focused on the sat nav as the one in our previous car in Nice simply didn’t work and we were left to our own devices. Way too stressful, particularly with the congestion of the city areas. 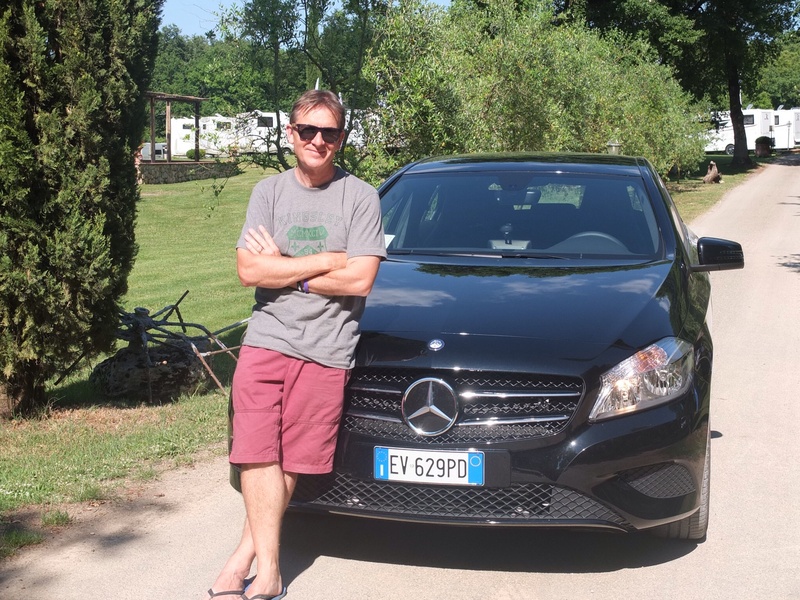 We input the address of our resort in Tuscany and then also make sure that the address of the rental car office is inputed. Right then. We are offered a bit of an upgrade on the car. Ok we’ll take that. We’re also offered an option on some insurance. No thanks, our travel insurance will do the trick. Sat nav in place its time to hit the road in our brand new black Merc. Why am I driving a car like this? Hate the eco feature in these cars that literally turns the motor off when the footbrake is engaged. Climate be damned, turn it off. These cars are too smart for their own good. Sat nav is working well. We manage to get out through Florence. Gee the streets and roads in these European countries are narrow. Driving on the right hand side of the road is a challenge. Whats this? The sat nav stops talking to us as we blaze away towards Siena on the motorway. May be its taken exception to our language as we have had a few freakout driving moments. Here we go again. As we turn off the motorway and head for our little provincial area of Monteriggioni near Siena (population 9165) we are again forced to rely on our own navigational skills. So sick of this. Crazy. Will possibly never do the rental thing in Europe again. Countryside looks great but we are unable to take advantage of the views. 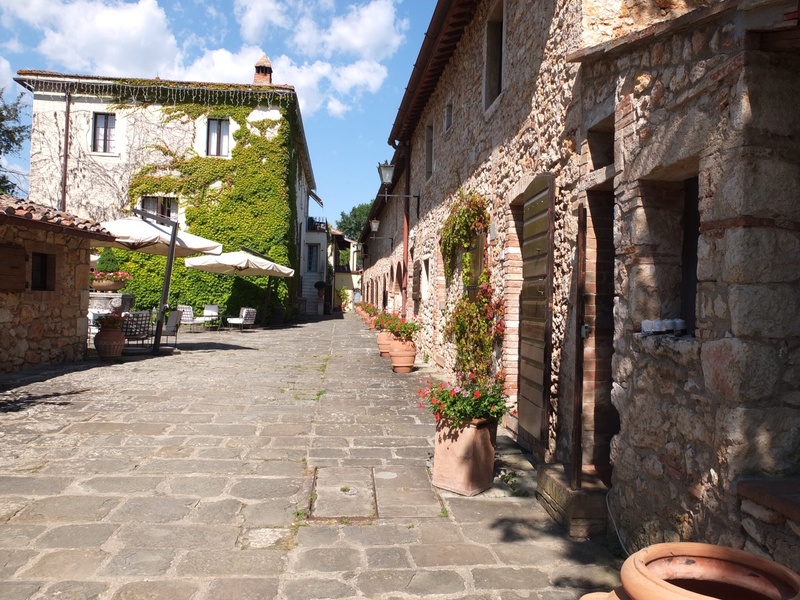 Alot of communes in the countryside in Tuscany. It would appear that Monterriggioni is a mediaeval walled town/ commune built in 1214 by the people of Sienna as a front line in their war against Florence. 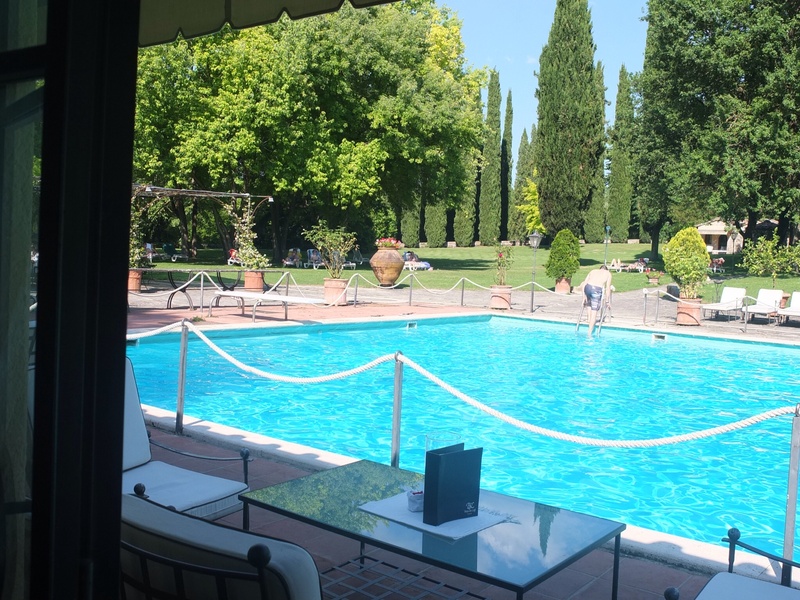 We stop several times to talk to some helpful locals (once at an old castle/ commune) and then there it is, our resort (Borgo San Luigi, a renovated 17th century palace) for the next 2 days. Pretty warm at this stage. Our new digs are pretty salubrious. Its a palace, dude. Sort of an oasis. Pool, restaurant, green lawns, MTV playing in the background and, a Winnebago conference with more Winnebagos than you could poke a stick at. Winnebago conference? Apparently various countries have been represented here over the last few days. France, Netherlands. They must be Winnebago dealers. Hmmm. Ok. We manage to get some late lunch and a few cokes, then repair back to our accommodation to freshen up. Dinner is a sophisticated affair around the pool. Back to our room. We check out the only English speaking channel on the TV, CNN, and reflect on another crazy rental car day. ~ by gazlington on June 10, 2014.